140 Marlborough is located on the south side of Marlborough, between Clarendon and Dartmouth, with 138 Marlborough to the east and 142 Marlborough to the west. 140 Marlborough was built in 1872-1873 by John Fisher Farrington, a carpenter and builder, for speculative sale, one of five contiguous houses (140-142-144-146-148 Marlborough). He had built three contiguous houses in 1871-1872 at 132-134-136 Marlborough. 138 Marlborough was a vacant lot until 1891. Click here for an index to the deeds for 140 Marlborough. On December 20, 1873, 140 Marlborough was purchased from John Farrington by attorney Alexander Strong Wheeler. He and his wife, Augusta (Hurd) Wheeler, lived at 72 Marlborough. On February 3, 1874, 140 Marlborough was purchased from Alexander Wheeler by importer, dry goods merchant, and real estate investor James Lovell Little. He and his wife, Julia Augusta (Cook) Little, lived at 2 Commonwealth. He purchased 140 Marlborough as trustee for his daughter-in-law, Mary Robbins (Revere) Little, the wife of his son, James Lovell Little, Jr. They had married in January of 1874 and 140 Marlborough became their home. He was a dry goods merchant in his father’s firm. When he sold 140 Marlborough to Alexander Wheeler, John Farrington retained the eastern 6 inches of the lot, with half of the party wall on it, presumably on the assumption that he would sell it to whomever built a house on the still-vacant lot at 138 Marlborough. Instead, on April 11, 1874, he sold the strip of land to James L Little. The eastern wall of 140 Marlborough had not been placed so that the boundary line between 138 and 140 Marlborough ran precisely down the middle of the 12 inch thick wall. 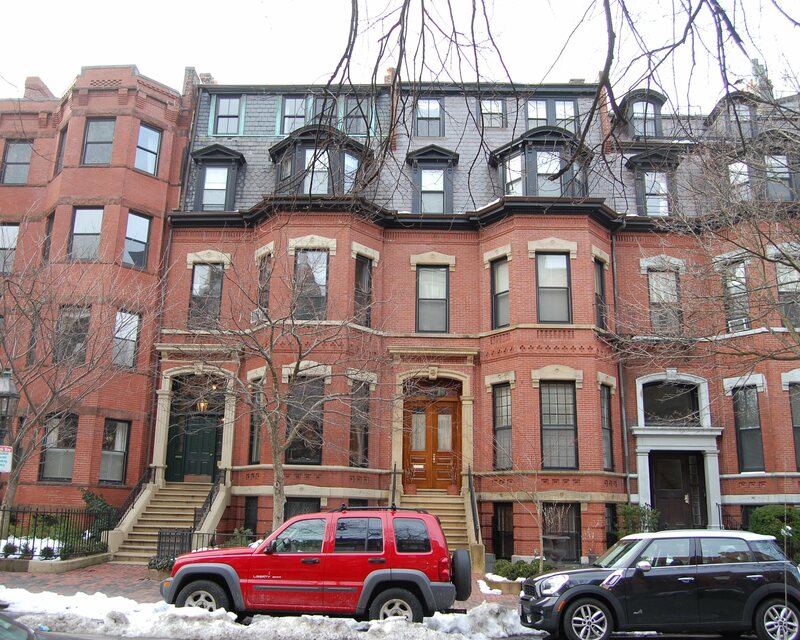 Accordingly, on February 21, 1891, when builder George Nason was planning to construct a four unit apartment house at 138 Marlborough, James L. Little, Jr., sold him a portion of the 6” strip with a 0.35 foot frontage on Marlborough and a 0.45 foot frontage on the alley, and then entered into a party wall agreement with him governing the wall. James and Mary Little continued to live at 140 Marlborough in 1878, but moved thereafter to Brookline. 140 Marlborough continued to be owned by James L. Little as trustee for Mary (Revere) Little and leased to others. 140 Marlborough was not listed in the 1879 Blue Book. By the 1879-1880 winter season, 140 Marlborough was the home of Horatio Greenough Curtis and his wife, Annie Neilson (Winthrop) Curtis. They previously had lived at 80 Marlborough. Horatio Curtis was a shipping merchant in the Calcutta trade and later a sugar refiner. By 1885, he was agent for the Pacific Guano Company, and from 1891 to 1916, he was president of the Old Boston National Bank. They continued to live at 140 Marlborough during the 1881-1882 season, but moved thereafter to a new home they had built at 179 Marlborough. By the 1882-1883 winter season, 140 Marlborough was the home of cotton mill treasurer Samuel Leonard Bush and his wife Emeline (Emma) Bicknell (Franklin) Bush. They had lived at 80 Marlborough during the previous season. Samuel Bush died in April of 1884. Emma Bush continued to live at 140 Marlborough. Living with her were their unmarried children — Samuel Dacre Bush, Emma T. Bush, and Mary L. Bush — and her unmarried brother, Daniel B. Franklin. They continued to live at 140 Marlborough during the 1884-1885 season, after which they moved to a new house they had built at 283 Beacon. On January 21, 1886, James L. Little transferred 140 Marlborough to James L. Little, Jr., still as trustee for Mary (Revere) Little. By the 1885-1886 winter season, 140 Marlborough was the home of Edmund Hamilton Sears, Jr., where he operated a “school for young ladies.” By the 1888-1889 season, he had moved to 233 Marlborough, where he continued to operate the school. By 1888, 140 Marlborough had become a lodging house operated by Miss Delia Murphy and a kindergarten school operated by Miss Edith Annie Fiske. Miss Fiske lived at 140 Marlborough and also maintained a home in Milton. In his biography of Noble Laureate Dr. George Richards Minot, The Inquisitive Physician, Francis M. Rackemann comments that Dr. Minot attended Fiske School from the age of six (ca. 1891-1892), and describes Miss Fiske as “an energetic, able woman of strong character, who each year introduced a new group of little boys and girls into the mysteries of the three R’s.” He indicates that the school was “in a private home on Dartmouth Street,” which appears to be an error, inasmuch as as the school was located at 140 Marlborough (near Dartmouth). By 1890, Dr. Walter Lincoln Burrage, a gynecologist, was a lodger at 140 Marlborough. By 1892, Dr. John L. Morse, a physician, also was a lodger there. Walter Burrage married in October of 1894 to Sally Swan. After their marriage, they moved to 317 Marlborough and Dr. Morse moved with them. In 1894, Harriet Mulford (Stone) Lothrop, the widow of publisher Daniel Lothrop, was a lodger at 140 Marlborough. She was an author of children’s books (notably the “Five Little Peppers” series), writing under the name Margaret Sidney. She had lived at the Copley Square Hotel (northeast corner of Huntington and Exeter) the previous year. Her primary residence was Wayside in Concord, once the home of Nathaniel Hawthorne, which she made her year-round home in 1895. At the time of the 1900 US Census, Miss Murphy had two lodgers: Nelson Randolph Bradford and Frank Florence. In June of 1900, Edith Fiske married to Dr. Edward Hickling Bradford. He was a physician and surgeon, and later would become Dean of the Harvard Medical School. After their marriage, they lived with his mother at 218 Beacon. Delia Murphy continued to live at 140 Marlborough and Edith (Fiske) Bradford continued to operate her school there until about 1904. By the 1904-1905 winter season, 140 Marlborough had become the home of Miss Caroline Hooper Fabens and Miss Jeannette (Janet) W. Forbes. Miss Fabens acquired the Fiske School from Edith (Fiske) Bradford and operated it with Miss Ada Dana. Miss Fabens lived at 140 Marlborough and in Marblehead; Miss Dana lived in Newton. Miss Fabens also continued to accept lodgers at 140 Marlborough. James L. Little, Jr., and Mary (Revere) Little both died in August of 1914, one day apart. 140 Marlborough was inherited by their three children, James Lovell Little, III, Laura Revere Little, and Clarence Cook Little. On March 17, 1917, Laura and Clarence Little transferred their interests in the property to their brother, James. On May 7, 1921, Caroline Fabens acquired 140 Marlborough from James Lovell Little, III. Jeannette Forbes continued to live at 140 Marlborough until about 1929. Caroline Fabens continued to live there until about 1930, operating the Fiske School. She also continued to rent units to several other families. By September of 1930, Caroline Fabens had leased 140 Marlborough to the Katharine Gibbs School as a dormitory, and had made Marblehead her year-round home. The house was not listed in the 1932-1934 Blue Books and was shown as vacant in the 1932 and 1933 City Directories. In August of 1933, Caroline Fabens applied for (and subsequently received) permission to convert the property from single-family dwelling to four apartments (3 single units and 1 duplex). 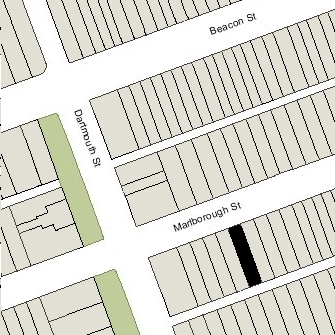 It appears that the fourth story was expanded at this time (140 Marlborough is shown as 3-1/2 stories plus a basement on the 1928 Bromley map and as 4 stories plus a basement on the 1938 map). Caroline Fabens died in April of 1951. On October 14, 1953, 140 Marlborough was acquired from Caroline Fabens’s estate by Alice B. (Hicks) Runge, the wife of Dr. Paul Martin Runge, a physician. They lived in Randolph. On August 31, 1966, 140 Marlborough was acquired from Alice Runge by Lenk Properties, Inc. (Richard Van Siclen Lenk, president). On August 31, 1967, 140 Marlborough was purchased from Lenk Properties, Inc., by publisher Paul Edwin Prindle and his wife, Susan (Dwight) Prindle. They previously had lived at 44 West Cedar. They continued to maintain it as a four-family residence. Paul Prindle died in April of 2000. After his death, Susan Prindle continued to live at 140 Marlborough. On December 3, 2007, Susan Prindle transferred ownership to the 140 Marlborough Street LLC, and on December 6, 2008, the 140 Marlborough Street LLC transferred the property to Susan Prindle and her son, Carl Prindle, as trustees of the 140 Marlborough Street Realty Trust. 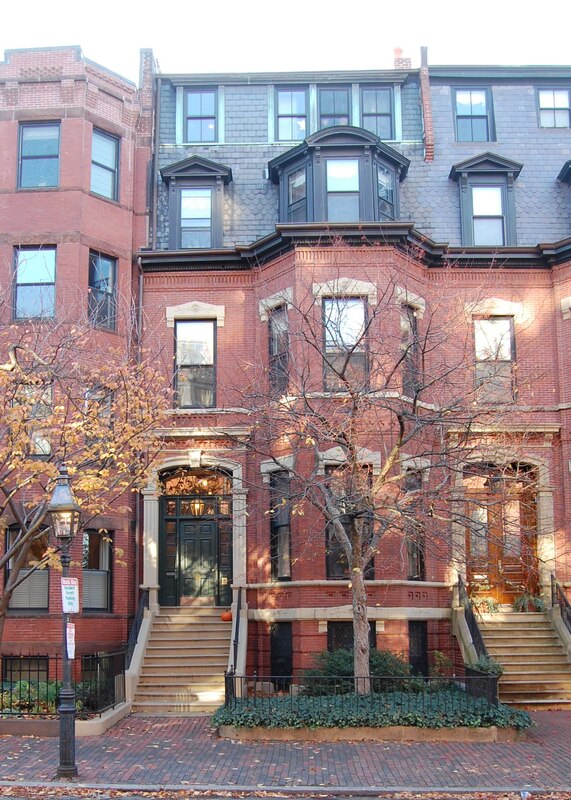 On January 11, 2012, they converted the property into two condominium units, the 140 Marlborough Street Condominium.